20 years ago one man had his life’s effort trashed by a computer. 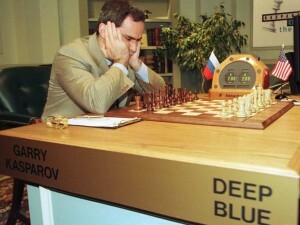 In May 1997, IBM’s Big Blue computer beat Chess World Master Gary Kasparov. Last month he published the story of that defeat in “Deep Thinking: where machine intelligence ends and human creativity begins”. It is, as the title indicates, a positive spin on the chess defeat, with lessons for everyone who’s worried about the robots that are coming to take industry jobs. Two decades ago IBM publicised the Big Blue victory as widely as possible, and the story of the defeat of man versus machine is as much about a pr victory as about technology. In fact one might imagine that pr jobs will be some that might be safe from the robots, as manufacturing a good press release has so far proved algorithm proof for businesses looking to gain positive publicity. Of course Moore’s Law did make the computer’s victory against one man inevitable. Men get older whereas computers get smarter. We must allow the robots to take over the jobs that they are better at. They are only as good as the information that we feed them, and at the decisions we allow them to take. They’re great at analytics. They’re obviously less great at disregarding evidence and making a big surprising strategic leap. In 2004 Kasparov said “Ultimately, what separates a winner from a loser at the grand-master level is the willingness to do the unthinkable”. The real competitive edge will not come from a data and tech arms race but from a set of people who know how to interpret the data, understand the trends that inform it, and can invent new communications strategies from the learnings in an agile way. “We tend to overestimate the effect of a technology in the short run and underestimate the effect in the long run”. So says Amara’s Law, which we see repeatedly play out in nearly every new thing in media and marketing. It’s best illustrated by the annual Gartner Hype Cycle, which plots new tech every year in 5 stages. The initial “cognoscenti/geeks” only “technology development trigger” is followed by the very public “Peak of inflated expectations”. (That’s usually when you read about it as the crucial next big thing, burning platform). 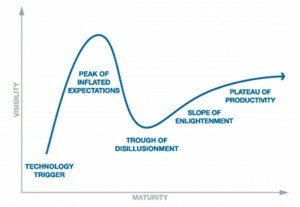 Then there’s the “Trough of disillusionment” when you frankly lose interest, the experiments haven’t work and you get sick of some chap in jeans, expensive trainers and black t-shirt telling you if you’re late to market you’re prey for the competition. The next stage is the “Slope of Enlightenment” where second stage products that actually work are available. And finally there’s the delightfully named “Plateau of productivity” for mainstream adoption and real roi. The latest 2016 Hype Cycle placed both Virtual Personal Assistants and Smart Workplaces firmly on the upslope of inflated expectations. Which means they think we’re talking a good game about them, but that they’ve yet to have real impact. Augmented Reality is near the bottom of the trough of disillusionment, but virtual reality is progressing nicely up the slope of enlightenment. 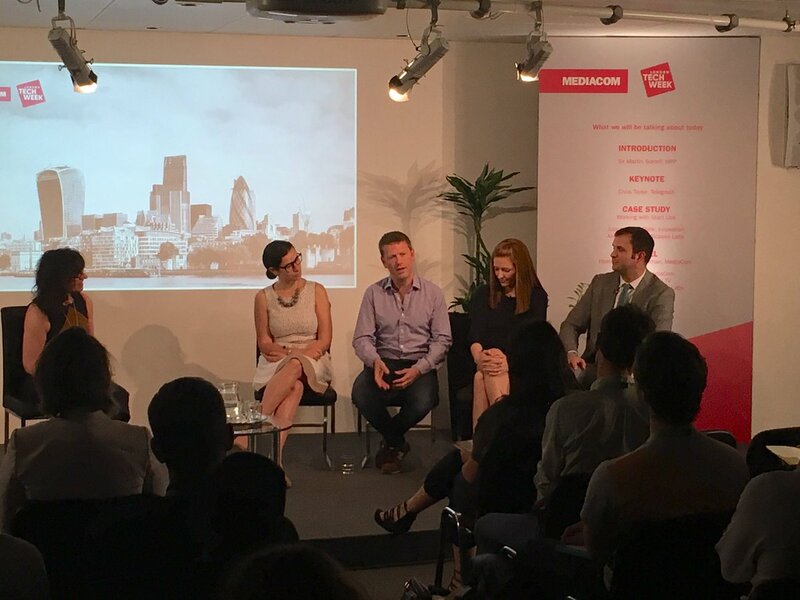 Recent research from MediaCom’s Real World Insight Team would suggest that there is another trend, outside of technology, that is firmly on the up in that regard too. Cause related marketing. Whereas in the past consumers have accepted that there might be a trade-off between value for money and acting with meaning or purpose, it’s now clear that they expect and demand both. Two thirds expect brands to give back to society. 80% that brands should minimise their environmental impact. You could in the past expect that just a fringe minority of customers would take purpose and meaning so seriously that they stopped buying the brand because another one did more for society, or that they’d heard or read something derogatory about it. Our research reveals that, in fact, over half the population have bought a brand or stopped using one because of its behaviour or values. 40% people have stopped using a brand because of its behaviour, naming these reasons in particular: Animal testing; not paying tax in UK; irresponsible sourcing of products; not being sustainable and irresponsible marketing. There’s a clear correlation now between clarity of purpose and brand equity. Abandoning a brand because you don’t like what you hear about it is becoming mainstream. This adds to the dangers of Fake news for brands, and means a coherent social media strategy, one that is always on, is a necessity. The research indicates that the zeitgeist has changed. Consumers are much less prepared to accept a trade-off between value, service and ethics in the way they were in the past. As with mobile site load times or hour slot deliveries, the public want it all and want it now. If there’s no convincing alternative then there’s apathy sure. There is a competitive advantage for brands that can deliver in their sector. It has to be convincing. Our research also shows a strong level of cynicism, which is of course reinforced in this year’s Edelman Trust barometer. Edelman has pointed to a “crisis of trust” in the UK. These issues create strong challenges for traditional advertising. The answers lie in joined up thinking between corporate social responsibility teams, user experience teams and marketing. The need to leverage all the best about the brand and to tell an authentic story through marketing is more urgent than ever. No hype.